South Africa has an excellent jazz scene. Dave Love, the founder and owner of Heads Up International has made nine trips to SA and the result of these travels is the partnership with Sheer Sound, South African's largest record label. "Smooth Africa I", their first cooperation, was the reason to review some of South African artists as Sipho Gumede, Absolute Zero, Moses Khumalo, Louis Mhlanga, Paul Hanmer, Wessel, Allou April, Prince Kupi, Pops Mohamed, McCoy Mrubata, Ernie Smith and many more. 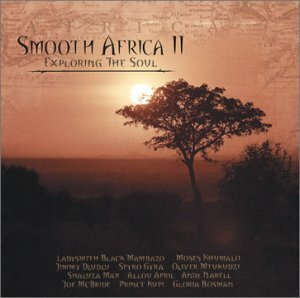 After the tremendous success of "Smooth Africa I" the follow up "Smooth Africa II - Exploring The Soul" is a must. Dave Love has assembled anew some of the finest music one can listen to. "I had fallen in love with the entire country, its people, its culture," says Love. "But mostly I was amazed by the talented local musicians who played with Joe, and felt they needed to be heard outside of South Africa." The opener Walk of Life, taken from the album "Afrocentric" and featuring the Soweto String Quartet, presents a popular song of Jimi Dludlu. His 1997 debut album for PolyGram, "Echoes from The Past", was well received by audience and critics. Jimi is called a "guitar wizard of jazz" and he really deserves this title. The African group, Ladysmith Black Mambazo, is certainly the world's best-known due to their cooperation with Paul Simon on his album "Graceland". Simon incorporated the traditional sounds of black South Africa into the "Graceland" album, a project regarded by many as seminal to today's explosive interest in World Music. The group 's name came about as a result of winning every singing competition in which the group entered. "Ladysmith" is the hometown of the Shabalala family; "Black" makes reference to black oxen, considered to be the strongest on the farm. The Zulu word "Mambazo" refers to an ax - symbolic of the group's ability to "chop down" the competition. So good were they that after a time they were forbidden to enter the competitions but welcomed, of course, to entertain at them. The tune Uniting Nations Together is a traditional Zulu song about uniting as a nation rather than relying on other countries to help resolve your problems. A theme which is often played by South African musicians. The song is remixed by D'Influence. Bringing Joy by Allou April is his debut album at Sheer Sound. The title song was produced by Allou April himself at Akoustic Music Studios in Cape Town in November 2001. Obviously his visit card to the entrance of Sheer Sound this tune has the original South African flavor like rhythm, choir and guitar riffs. The message of this well tempered song arrived America. Shaluza Max, the recent winner of a the SAMA for Best Zulu Album, is a blessed singer whose vocals are perfectly supported by the driving, thumping grooves of "Mangase". This song is taken from his album "Impilo". Impilo (meaning Life), Max's newly released second album, is based on observations of life in South Africa. Dedicated to the memory of Moses Taiwa Molelekwa, it's absolutely dancable. Joe McBride's Aderley Street is featuring South Africans Gerald Stockton on bass and Mike Drake on drums. African rhythm is meeting American Smooth Jazz. The guitarist, vocalist and composer Oliver Mtukudzi contributes Neria, from his soundtrack written for the internationally acclaimed feature film from Zimbabwe of the same name. The film tells a story about the Zulu widow Neria who is dispossessed of her matrimonial property by the relatives of her late husband. A sad song for a critical film. The song was taken from his album Neria. Andy Narell is besides Joe McBride Heads Up Records' second artist who performed before 60,000 fans at South Africa's largest music festival, Arts Alive. He also played sold out concerts in Cape Town, Durban and Pretoria. On the dynamic Punch Andy 's steel pans are accompanied by special African artists. The South African flavor turns on with Botsotsi by Prince Kupi. The song is especially recommend to fans of percussion music. Concerning the title "Bo-Tsotsi" It's a traditional folk tune that was in the townships when Prince Kupi was growing up. The song is taken from the Andy Narell-produced album "Loxion". Hymn for Taiwa are Moses Khumalo's saxophon and especially Africa Mkhize's piano in long improvised solos. One cannot deny a certain Gospel mood. This tune was taken from Moses' album "Mntungwa", a South African cjazz jewel. "Joe McBride goes South Africa" that could be the sub-title of Yebo. Gloria Bosman's Umuntu Wakho is taken from her newest album "Stop And Think" (2003). This album will remind many fans of her first appearances when she built a reputation for singing the standards better than they were originally performed. It earned her two nominations at the 2003 South African Music Awards ceremony held in April. Spyro Gyra's album "Original Cinema" is presented with Capetown Love. The rhythm is supported by Andy Narell on steel pans and Dave Samuels on vibes. This song was inspired by Spyro Gyra's performance at the North Sea Jazz festival in Cape Town and the Joy of Jazz Festival in Johannesburg. In toto Smooth Africa II is a worthy follower to Smooth Africa. Dave Love has a golden hand in selecting the tracks for this collection. You will not get your foot down before the last tone. Dave has written in the liner notes that this album is the second in a series that he plans on releasing. What a splendid future.